Q. Can I print from my cell phone or personal laptop? Can I print from my personal device? Does the NY library have mobile printing? You can print from your personal device (cell phone, laptop, tablet) at the White Plains campus library and the NYC campus libraries at 41st and 43rd streets. If you are at another campus, ask a librarian what type of mobile printing is available (B/W only, color, 1 or 2-sided), and which printer to choose if you have a choice, then login to the Pharos Print Center. Go to http://print.berkeleycollege.edu/myprintcenter and log in with your Berkeley username and password. Click Upload to add your document to the job list. Choose your print options (single or double sided, color or black and white, etc.). Select the appropriate printer for your location. If you are unsure what the correct printer is, ask your campus librarian. Click Print, and then a confirmation screen will appear. Once you are ready to release the job, click Confirm. 1. Go to the Pharos Print Center System at http://print.berkeleycollege.edu/myprintcenter and log in with your Berkeley username and password. 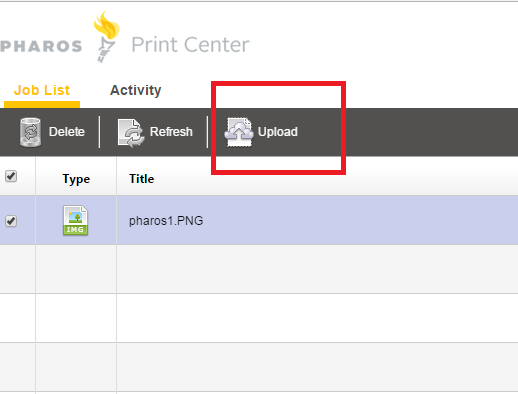 2.Once logged in, click Upload to add your document to the print center. You can add multiple documents, delete documents, and select which to print from this screen. 3. Use the Print Options section in the bottom middle of the page to select how you want the document printed. Choose black and white or color, single or double sided, and number of copies. 4. Before printing, you have to select the printer to send the job to. Click on Select a Printer in the bottom right corner of the page. Type to search for the correct printer. If you are not sure what the printer is called, ask your campus librarian. For the 43rd Street library, the printer is NYC_LIB_BW_P1. For the 41st Street library, the printer is NYM_LIB_BW_P1 (or P2) AND NYM_LIB_COLOR_P1 (or P2). For color printing, don't forget that after you find and select the color printer, you still need to choose "color" (and/or other settings) from the Print Options section in the lower middle of the page. Otherwise, it will still print in black and white. 5. Once you've selected the correct printer, click the yellow Print button in the bottom right corner of the page. A confirmation dialog box will come up showing the total charge for your print job. Click confirm to release the print.